Life with Bethie the Boo: At last...colorful legs! 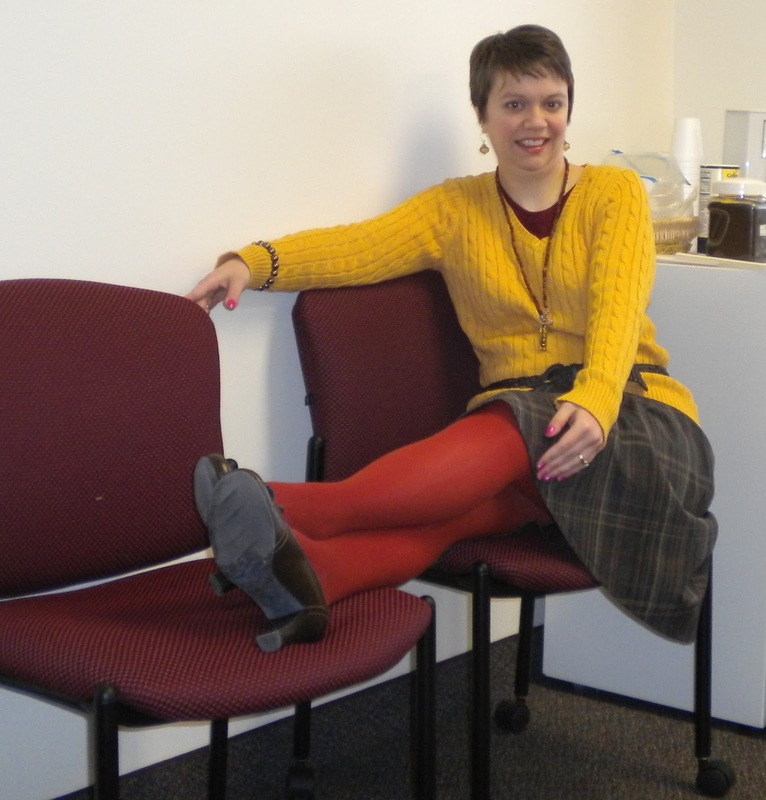 You guys it is FIVE degrees above ZERO this morning (Fahrenheit that is) but I don't care - I suffered the cold to show off that I finally got colored tights! How long have I been lamenting about this? Many of you suggested Target and that they had colored tights for $5.00 - which they did, but they were pretty picked over when I went. I wanted yellow or blue but they were out, so I settled for these rust colored ones here. I'll check another Target to see if I can find the other colors I want! So cardinal sin of blogging - I know I keep making changes to the appearances of the blog. I apologize for that, I'm trying to make it slightly cleaner and more aesthetically pleasing. Not sure if I've made it better or worse, but anyway, stick with me I think I'm nearly done. If you have feedback - even constructive criticism I'll take it! We're already halfway through the week. I like that I have to say. I'm not going to complain! Coldest air of the season coming in this week though, if you think five above zero is bad, tomorrow I hear we're going below zero for the first time all winter. That's pretty rare, it has usually happened by now! This winter is anything but ordinary! In other news, I've had my iPhone almost two months now and I'm having so much fun with apps. I got an iTunes gift card from my sister-in-law for Christmas so I could download more apps. Yesterday I made the happy discovery that Words with Friends was on sale. I've been playing Scrabble already because of a couple of friends who play that version, but I've been wanting to try Words with Friends too because I know other friends who play it. I don't know if any of you play, but I'll play with anyone who wants to - my username is muppetmusic22 on both Scrabble and Words with Friends. I need the practice, I told my sister-in-law yesterday I need to go back to school! My word choices are pretty pathetic! I can only improve! Nice outfit... Do you do anything to build skills on Words With Friends? Once I discovered that unscrambling anagrams helped with that jumble of letters, my scores steadily went up in WWF and Scrabble. I got so into anagrams, I invented my own TV trivia anagram game. Let me know what you think of it. I love the colored tights on you. Love the outfit!! I think I might have to try Words with Friends. We are already Scrabble buddies :). I love the colorful tights. I'm having problems convincing myself to put on tights because of the cold weather. I also love your sunny sweater!~ The perfect shade of yellow. I adore scrabble. I'm a vocab/word enthusiast. I just haven't gotten into the online versions. I wish I could though. Love your colored tights with the bright color of your sweater. A great color combo! I'm a colored tights newbie too. They seem to be great accessories to an outfit and fun too! I need to work on incorporating them into outfits. These look so cute with that bright yellow sweater! And I love how you have the rust colored shirt peeking out of the sweater, too! i really like the colored tights!!!! i'm looking for some skinny jeans with that same color! 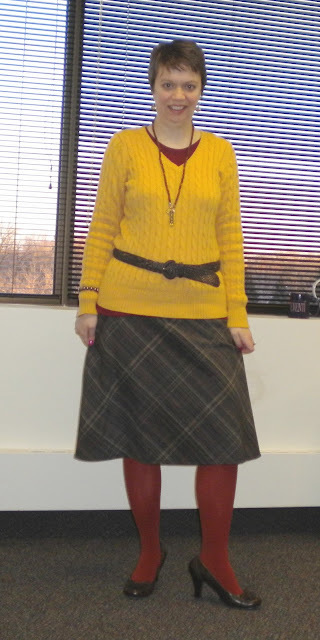 Loving this yellow and red together! So pretty with your plaid skirt too.